On Friday, August 14, 2015, board and staff members of RFKC and RCKC met at the Standard Grill in Manhattan for a delicious and fun 79th birthday celebration for Elder Hae Min Chung, who is the President of the Research Foundation for Korean Community (RFKC). President Chung's eldest daughter also attended the party. We are happy to have been a part of a wonderful celebration for a man who has served the community in a variety of different ways, and we wish President Chung continued good health and prosperity. The Washington, D.C.-Baltimore metropolitan area has emerged as one of the fastest-growing places of settlement for Korean immigrants in the United States. With more than 104,322 Koreans (single-race Koreans) residing in the region (ACS 2009-2011), it is the third largest Korean community after Los Angeles (301,534) and New York (203,020). 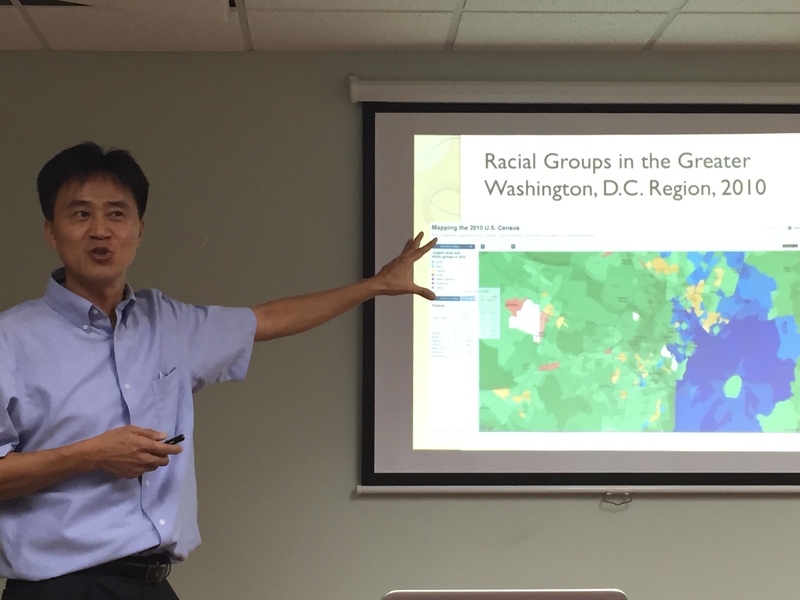 Through an examination of the rich history and evolution of the Korean community in the greater Washington, D.C.-Baltimore metropolitan area, as well as Korean immigrants’ patterns of settlement, forms of economic adaptation, and structure of community and political organizations, the paper seeks to provide a timely portrait of the evolution and state of the Korean community in a new immigration gateway city. The paper draws on multiple sources of data, including the 2009-2011 American Community Survey (ACS), the 2003 Washington-Baltimore Korean Community survey (a survey commissioned by the Centennial Committee of the Korean Immigration to the United States, Washington, D.C.), a monograph commissioned by the Korean American Foundation-Greater Washington entitled, “History of the Korean-Americans in the Washington Metropolitan Area, 1883-2005,” the 2014 Giant Korean Business Directory, and twenty in-depth interviews conducted with Korean community leaders, long-time residents, and newcomers in 2011. In particular, Professor Kim talked about the concentration of Koreans and the emergence of Korean business districts in Fairfax County (VA), Montgomery County (MD), and Loudoun County (VA). 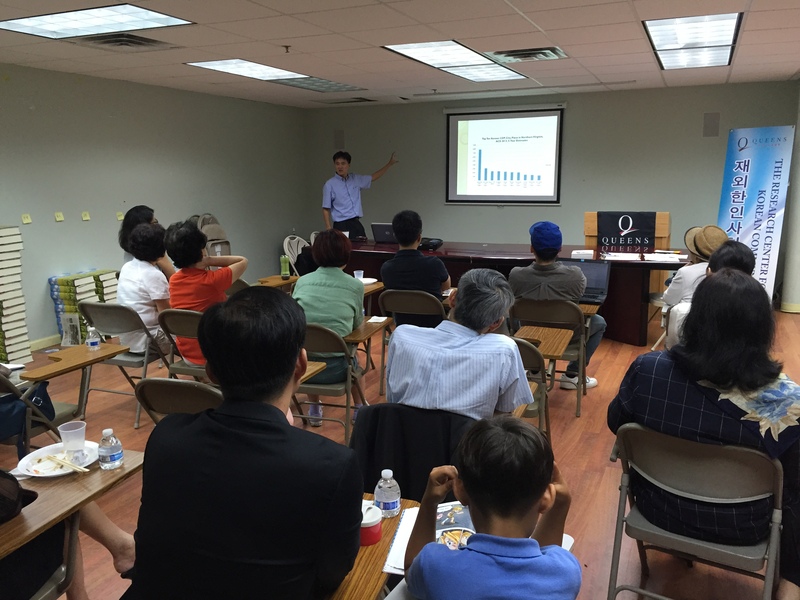 Centreville, VA and Annandale, VA have especially high concentrations of Korean residents. Professor Kim cited stable government jobs and highly rated school systems as pull factors that have attracted Korean immigrants and Korean Americans to settle in the metro DC-Baltimore area. Some of Professor Kim's research interests include immigrant integration, particularly the integration of the children of immigrants, into new host countries. He has published articles in Sociology of Religion, International Migration Review, Ethnic and Racial Studies, and Sociological Forum. 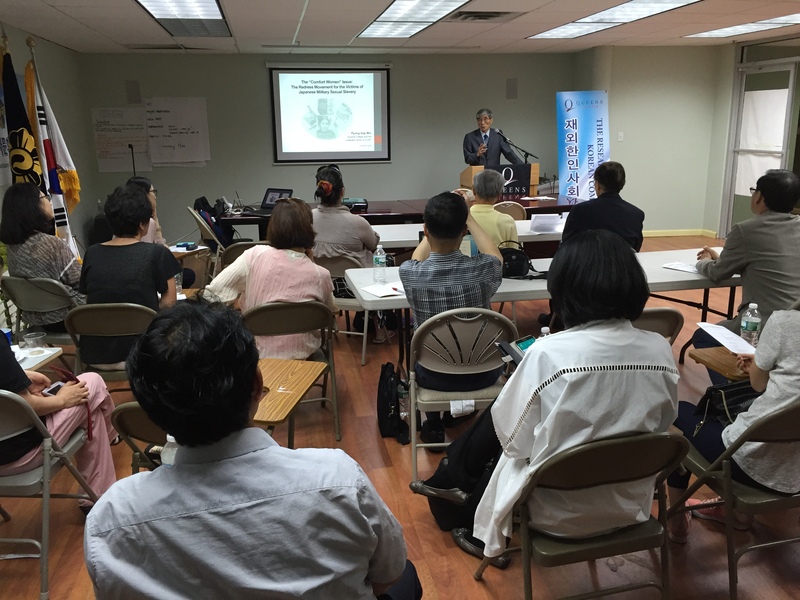 On Wednesday, June 24, 2015, the Research Center for Korean Community hosted a seminar at Korean American Youth Foundation in Flushing. RCKC's director, Professor Pyong Gap Min, gave a talk titled "The Emergence of the 'Comfort Women' Issue and Survivors' Breaking Silence in the Early 1990s." He discussed a number of issues related to Korean victims of Japanese military sexual slavery during World War II. Recently, this tragic issue has been prominent again in U.S. and Korean media with Japanese Prime Minister Shinzo Abe's recent visits to the U.S. and to shrines of Japanese war criminals. 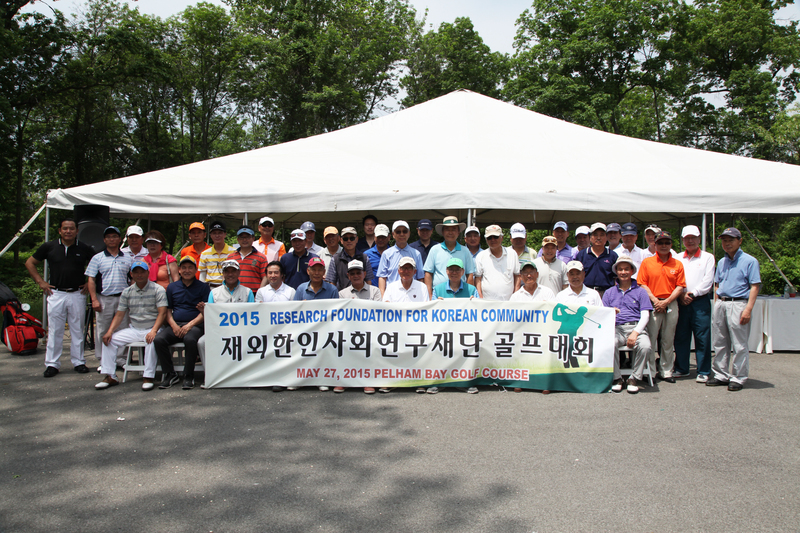 On Wednesday, May 27, 2015, the Research Foundation for Korean Community (RFKC) held its second annual fundraising golf tournament at Pelham Bay and Split Rock Golf Course in the Bronx. Over fifty golfers turned out for this year's event on a lovely and warm day, and over $13,000 was raised via donations and entry fees for the tournament. RFKC is a non-profit foundation established in 2010 to financially support the activities of the Research Center for Korean Community (RCKC) at Queens College. We would like to thank RFKC for organizing a fun and successful fundraising event. In particular, we would like to thank Jea-Seung Ko, Henry Hong Kyun Jung, and Hae Min Chung for doing extra work in organizing this event, as well all of the golfers who came out to support. 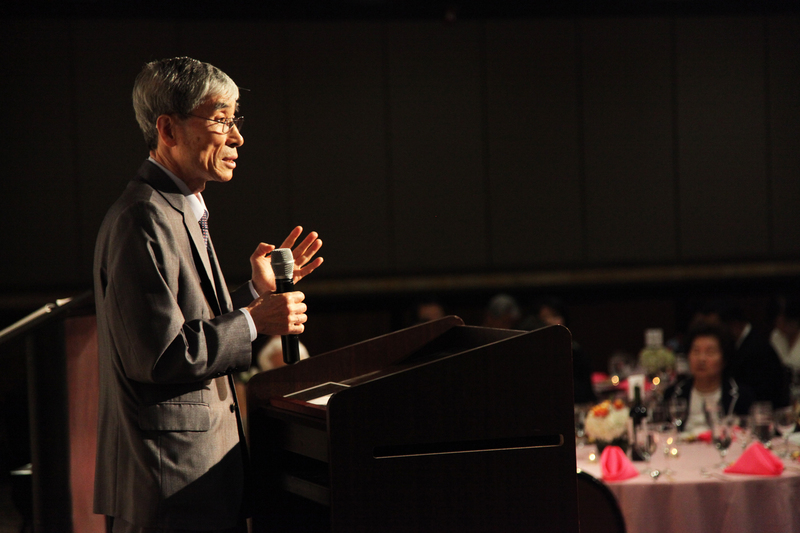 On Thursday, April 23, 2015, the Korean Language Association (KLA) held their tenth annual gala in Manhattan. 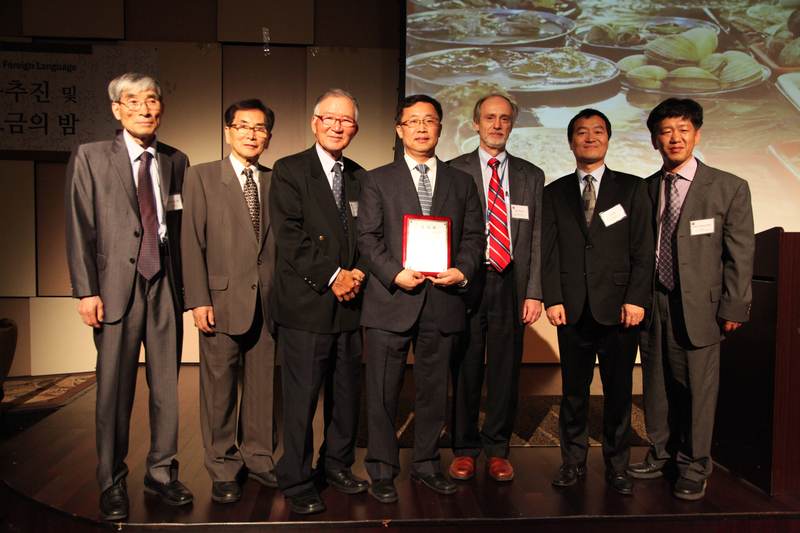 Professor Pyong Gap Min, the director of the Research Center for Korean Community (RCKC) gave a keynote address.